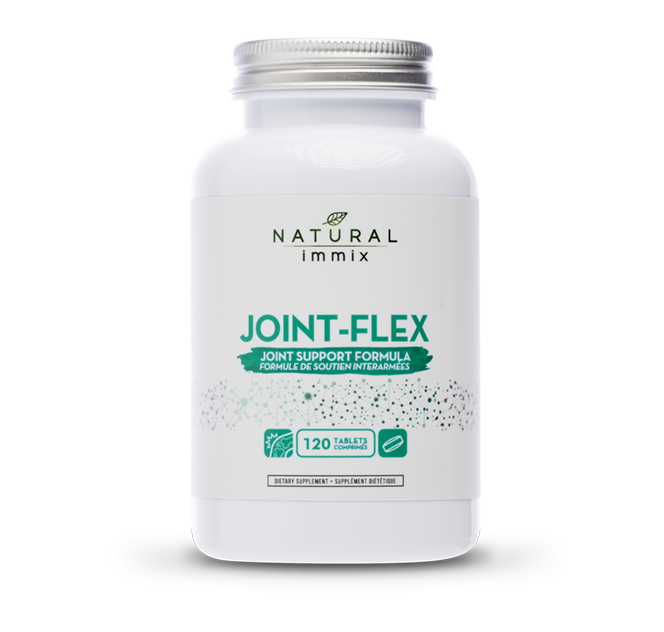 Joint-Flex is a synergistic joint formula that contains Glucosamine Sulfate,* Chondroitin Sulfate* plus other co-factors to promote the structural framework and maintenance of joint cartilage, healthy joint structure, function, flexibility and mobility. As a factor in the maintenance of healthy cartilage and joint health, it helps to relieve joint pain associated with osteoarthritis (OA) and protects against the deterioration of cartilage. Glucosamine and Chondroitin are not commonly found in foods, and the amounts that need to be ingested in order to see beneficial effects, generally require supplementation. Joint & Cartilage Health: Glucosamine and Chondroitin occur naturally in the body and are building blocks of healthy cartilage and other connective tissue by stimulating the manufacture of glycosaminoglycans which are key components of cartilage. Glucosamine Sulfate: is an amino-sugar (sugar molecule with a nitrogen) that is a naturally occurring chemical found in most body tissues, with high concentrations in joint and cartilage. It is also found in nature, for example, in the shells of shellfish and this type is often used in supplements commonly taken for arthritis. Scientists have studied it extensively for this use. It is most often used for a type of arthritis called osteoarthritis, which is the most common type of arthritis. Chondroitin Sulfate: is a supplement, frequently used in conjunction with Glucosamine, to combat the symptoms of osteoarthritis. It is a chemical that is normally found in cartilage around joints in the body as well as in nature. Research has shown that Chondroitin Sulfate also helped arthritis pain when taken with conventional medicines, such as aspirin, for pain and swelling. Boswellia: is an oleo-gum resin extracted from trees of the genus Boswellia, and the entire species of Boswellia is commonly known as Frankincense. Boswellia contains the primary active components, Boswellic Acids, which have been shown in clinical trials to have anti-inflammatory actions that suppress pain and immobility similar to that of non-steroidal anti-inflammatory drugs (NSAIDS). However, unlike NSAIDS, long-term use of Boswellia does not appear to lead to irritation or ulceration of the stomach. MSM: Methyl-Sulfonyl-Methane (MSM) is a naturally occurring small sulfur containing molecule present in a variety of foods, although the quantity in these foods is much less than that in supplementation, MSM from the diet is not likely to be a significant contributor. It helps relieve joint pain naturally by helping the body form healthy connective tissue in joints and muscles and can help improve the comfort and mobility of people with osteoarthritis. Turmeric: is a spice commonly used in curry, which has Curcumin and Curcuminoids as the main bioactive compounds. It has been researched for its properties that can reduce pain and improve function in people with osteoarthritis. In some research, Turmeric worked about as well as ibuprofen for reducing osteoarthritis pain. Bromelain: is an enzyme extracted from pineapples. Bromelain contains a combination of several compounds, including a large amount of a special protein-digesting enzyme. This enzyme is able to be digested and thus affect the blood and body, rather than just the stomach and intestines. Bromelain's anti-inflammatory properties are responsible for several of its effects. Grape Seed Extract: is a mixture of Tannins and Procyanidins (chains of Catechins) that appears to exert anti-estrogenic effects and may enhance blood flow. Ginger: is the common name for the root of Zingiber officinale, a plant that has historical precedence as both medicine and spice. Historical uses for ginger include headaches and migraines, as well as blood pressure and flow.